In 1988 Eric Sleichim founded BL!NDMAN, a saxophone quartet with a traditional line-up, which develops new performance techniques and substantially expands the repertoire for the instrument by continually exploring the boundaries with other disciplines. From the very beginning, the quartet has organized workshops and masterclasses for young musicians. The wish of a more structural collaboration between quartets of different generations, resulted in becoming a collective of 4 quartets. 20 years of stage experience accumulated by the original quartet �– BL!NDMAN [sax] �– is shared with three young quartets: BL!NDMAN [drums], BL!NDMAN [vox] and BL!NDMAN [strings]. The BL!NDMAN-quartets perform separately as well as in different combinations and formations. All four feature together in the �‘Kwadratur-Triptych�’, parts of which have been presented at deSingel Antwerp (B), Concertgebouw Brugge (B), Kaaitheater Brussel (B), C-Mine Genk (B) Mousonturm Frankfurt (D), Le Lieu Unique Nantes (F), Muziekgebouw aan �‘t Ij Amsterdam (NL). At the turn of the 21st century, Eric Sleichim concentrates on early music. In 1999 he arranges Bach�’s Choral Partitas for organ into a renewing score for saxophones. �‘BL!NDMAN plays Bach�’ becomes an instant success. Subsequently other programs with early music follow, often in collaboration with other specialized ensembles such as Huelgas Ensemble (2003 and 2010) and Collegium Vocale Ghent (2006). In 2012, Sleichim takes up the challenge to arrange early music for his complete collective (saxophones, singers, strings and percussionists on turntables) that will pay tribute to the Flemish polyphonist Adriaen Willaert in �‘Cross Talks�’. Further, �‘32 Foot/Sweelinck-Bach�’ is a new program for BL!NDMAN [sax] with arrangements of organ variations, commissioned by Festival Oude Muziek Utrecht for their 2012-edition. Part of the program will also be presented at the Musikfestspiele Sanssouci Potsdam. Eric Sleichim and BL!NDMAN won international acclaim with their multi-disciplinary approach and from the very start received assignments from the dance and theatre worlds, developed multimedia performances , provided live music for several silent movies and were asked to especially develop programs for several specific occasions. Since 2007 BL!NDMAN [drums] is touring with �‘Roman Tragedies�’ , a production of Toneelgroep Amsterdam with a score by Eric Sleichim (a.o. Festival d�’Avignon, Holland Festival, Wiener Festwochen, Barbican Center London, Festival TransAmericques Montréal, BAM Next Wave Festival new York,…) Also with Toneelgroep Amsterdam, BL!NDMAN [strings] presents Ivo van Hove�’s �‘Teorema�’ with music by Eric Sleichim at Ruhrtriennale (2009), at Stadsschouwburg Amsterdam and at Lincoln Theater Festival, New York (2010). In �‘Totem�’ BL!NDMAN [drums] + [strings] perform pieces by Eric Sleichim and British composer and DJ Matt Wright on 8 turntables while the Dutch video-artist Olga Mink presents live video. BL!NDMAN [sax] + [vox] present, together with Cristina Zavalloni, Eric Sleichim�’s opera/performance �‘Utopia :: 47 �– a very last Passion�’, premiered at the Holland Festival with a subsequent tour in Flanders (2011). 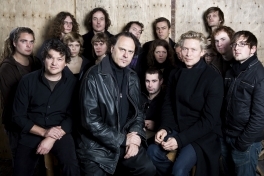 In Autumn 2012, BL!NDMAN [sax] + [drums] present �‘Whiplash�’, a program for which the ensemble especially commissioned new pieces by Mayke Nas, Riccardo Nova, Wim Henderickx, Frederik Neyrinck and Eric Sleichim. This program is also to be presented at the World Music Days 2012, together with selections for the ISCM-call for works. BL!NDMAN has been invited as ensemble in residence at the MATA-festival 2013. This will be the first occasion on which the BL!NDMAN-collective as a whole will perform in the U.S.